If we're talking about historical relevance, there are not many clubs in the world that can compete with Aston Villa. In addition to being one of the oldest football clubs in Britain, Villa are the originators of the Football League – the top flight in the country until the Premier League was formed in 1992. 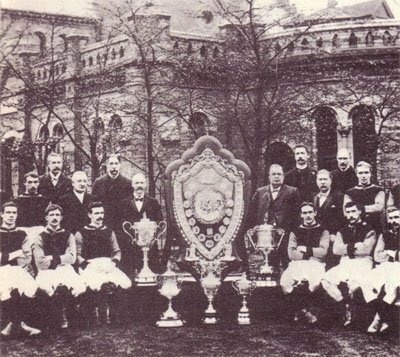 In its early history, Villa was one of the most consistent sides in English football, winning several First Division, FA Cup and League Cup titles. They are also one of only five English clubs to have won the European Cup/Champions League title. The Birmingham located Aston Villa Fotball Club was founded in 1874, by four cricket players who were looking for something to do during the winter break. The club was therefore founded approximately one year before the city rival Birmingham City (named Small Heath Alliance until 1905). In 1885, the club's president, William McGregor, realized a need to keep the fans interested in the game; together with eleven other leading English clubs of that period, Villa founded the Football League in 1888. Led by George Ramsay they quickly proved to be the most dominant side of the Victorian era, claiming five First Division titles and three FA Cups before the turn of the century. With the rise of football's popularity in the country, however, many other clubs started to emerge as contenders for the throne. Still, Villa remained a powerhouse; after winning another FA Cup in 1905, they followed it up with their sixth First Division title in 1910. After another two FA Cup victory in 1913, the club's golden era ended at the outbreak of the First World War. While Villa had started off the post-war period by claiming another FA Cup in 1920, it soon became obvious that their best years were behind them. After a long period of decline, the club was relegated to the Second Division in 1936, for the first time in their history. They did not win another trophy until 1957 and a famous victory over the Busby Babes in the FA Cup final. In 1961, Villa added to their trophy room by winning the inaugural League Cup. After a new low for the club – a relegation to the Third Division in 1970 – Villa turned a new leaf by appointing Ron Saunders as coach. They were back in the First Division by 1975, the same year that saw them win another League Cup. With Saunders' ability to spot a good player and his famous "no-nonsense" approach to coaching, Villa's streak of good results continued into the 80s. After a League Cup victory in 1977 and an unpredicted First Division title in 1981, Villa won their first and only European Cup in 1982 by shocking the favored Bayern Munich in the Final. One of the heroes was the reserve goalkeeper Nigel Spink that replaced Jimmy Rimmer early in the match and made some astonishing saves. The last triumph was however made without Ron Saunders as the coach. Some months earlier, after a dispute with the chairman Ron Bendall at a time the team had a negative trend in the league Ron Saunders had decided to resign. The Premier League era has not been as kind to Villa, which would mostly be seen in the lower half of the table. They did, however, managed to claim two more League Cups in 1994 and 1996. The Aston Villa crest is distinguished by the yellow lion drawing, "The Rampant Lion of Scotland" (left image). The lion has no obvious link to the club, instead it symbolizes the club's values in form of bravery and strength. Besides the “AVFC” initials for Aston Villa Football Club the lower part has also the word “Prepared” which has been a traditional motto (the motto has been removed in a new version with the initials and lion image slightly increased). Over the years, several badges has been in use, for example one in round shape (right image).